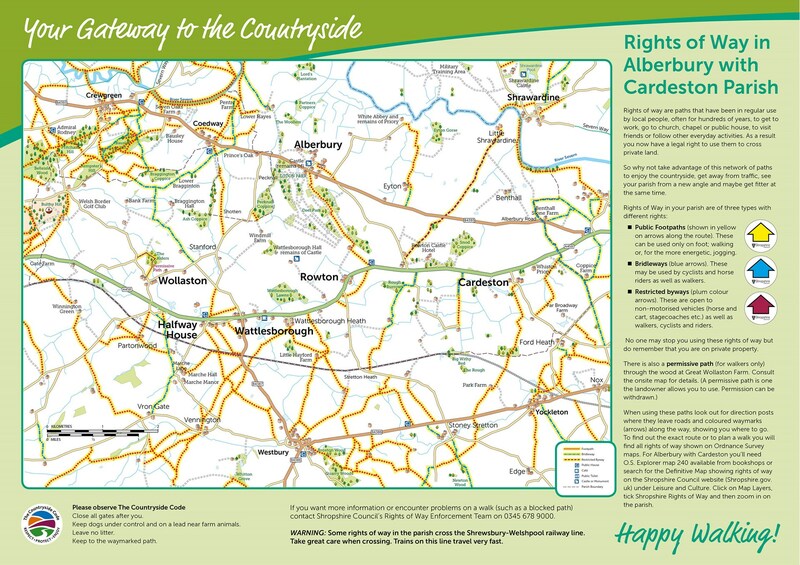 The Parish Council is keen to promote the use of local rights of way, which allow you to enjoy the countryside away from roads and traffic. To encourage this activity the Council has set information boards outside the parish halls in Alberbury and Wattlesborough. These have a map showing the various types of paths as well as information on their use. The Council has also appointed a Parish Paths Warden to look after the rights of way and try to resolve any difficulties encountered in using them, such as blockages or broken stiles. He is Phil Roberts who can be contacted on 01743 821276 for further information or to report problems with the paths. The Warden also runs a group of local volunteers in conjunction with Shropshire Council (under their Parish Paths Partnership scheme) who undertake repairs to faulty stiles and clear overgrown paths. Landowners. If you are a landowner with rights of way on your land, the Parish Council seeks your cooperation in ensuring that these remain unblocked and useable, not least by reinstating paths across fields after ploughing and seeding and leaving field-edge paths unploughed. Not only are you thereby complying with the law but can also expect the thanks of your fellow parishioners. The image below is downloadable - just right click on the image and select "save image as"